Monday through Wednesday we carry out routine home visits, where we visit the child and their families. We believe it is important to work alongside the families as much as possible in the child’s development. We believe that there will be no change in child’s life unless the parent carries out the work when we are not around. So much of the work we do is in training the parents in the different activities the child needs to do. This means going into the community to where the child lives. Currently we conductive home visits for 69 children. We work with the child as an individual to see that the child is able to reach his true potential. Activities are based on the child's individual needs. In some situations we train the parent on developmental exercises and give the child some basic physiotherapy.With other children who are have more physical abilities, we may assist the child to learn how to wash clothes, peel matooke or Irish potatoes, or fetch water. The idea is to enable the child to reach her true potential. We have seen a lot of change within the parent's attitudes by visiting the children at home. Previously the family had felt abandoned due to the child's disability. The change within the child has also been very positive. 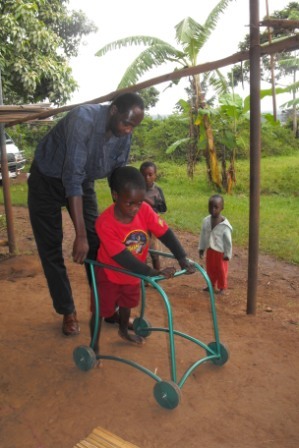 Many of the kids we work with need adaptive aids to help them with daily life. We currently provide five children with adaptive aids each month, which can help them to live life to their fullest potential. To provide these adaptive aids, we work alongside a local carpenter whom we pay to make them. Providing five children a month with an adaptive aid does not meet the needs to the kids we help. We need your help to see these children reach their true potential. KAFOs (Knee and Foot Orthosis). We give out wheelchairs as funds are available. Interested people can buy any of the adaptive aid direct or by contacting us for advise on which type to give.